Long-term growth can charge your portfolio, and these companies have what it takes to be dominant in their industries. Companies that are able to keep growing over very long periods of time can be incredible winners for investors. Growth cycles that last adecade or longer are usually based on durable competitive advantages that can lead to high margins and profitability. We asked three of our investors for their favorite long-term growth picks; they responded that Axon Enterprise Inc. (NASDAQ:AAXN), Boeing Co. (NYSE:BA), and Mastercard Inc. (NYSE:MA) were among the best of the best. Below, they explain why these companies have both growth potential and pricing power in the market. Travis Hoium (Axon Enterprise): Axon Enterprise is the leading provider of Tasers, body cameras, and cloud video storage for law enforcement agencies around the world. The company's traditional business has been comprised of Tasers, but in the last few years, the body camera and related services have become the real growth engine. And you can see in the chart below that growth has been extremely strong. AAXN Revenue (TTM) data by YCharts. The reason to love Axon's business long term is that body cameras are a booming, high-margin business with staying power. In the first half of the year, body camera sales were up 79.8% to $23.7 million and body camera service segment, which includes Evidence.com, were up 151.6% to $24.5 million. Gross margin in the services segment was 70.1%. What's wonderful about the model for investors is that law enforcement agencies that sign contracts to use Axon's cloud service Evidence.com and related services will likely be locked in far longer than their initial contract (often five years). Evidence.com integrates from police officers to prosecutors and new records management systems can cut down on paperwork, making an officer's life easier and data more accurate. Once the entire law enforcement system gets used to using these systems, the switching cost will be high. Despite the incredible growth at Axon, the stock has been flat for the last three years. That's partly due to the fact that new income is fairly low because management is spending on expanding research and development and sales teams. But those investments will drive further growth in the future, and over the long term, I think investors who hold this stock will be rewarded handsomely. Rich Smith (Boeing): With annual revenue north of $90 billion and a market capitalization approaching $150 billion, Boeing may not fit most standard definitions of a "growth stock." After all, how much bigger can Boeing grow, more than it's already grown? If you ask the folks who track Boeing's fortunes, though, the answer is: a lot. According to S&P Global Market Intelligence, 23 analysts keep track of Boeing's comings and goings, and the consensus among these analysts is that Boeing will grow its earnings at roughly 16% annually over the next five years. For context, that's 60% faster growth than the 10% earnings growth rate Boeing clocked over the last five years, so not only is Boeing still growing, but it's accelerating the rate at which it grows. How can Boeing do that? Having a yeoman's pile of work to do, already lined up, helps. At last report, Boeing had 5,665 orders for new planes in backlog and awaiting fulfillment. With customers beating down the doors to buy Boeing's airplanes, the company's growth rate is really limited only by how fast it can get the work done. Meanwhile, Boeing keeps bringing in more orders with every passing day. So far this year, Boeing has booked 426 net new orders -- enough new orders to nearly replace every plane it's managed to build and deliver this year, which helps to keep the company's huge backlog intact. 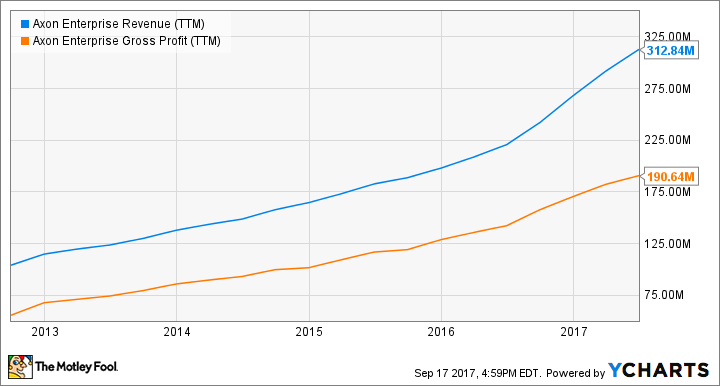 $150 billion market cap or no, Boeing still has a long runway of growth ahead of it. Dan Caplinger (Mastercard): Cash is king, but the world has increasingly moved toward electronic payment systems that promise better security and more efficient movement of funds both from consumers to businesses and between players across the global economy. Mastercard helped build out the credit and debit card industry, and now, the card giant has sought to retain its powerful position by establishing more modern ways to pay using the rise of the internet and mobile technology. Many see Mastercard as being an established blue-chip stock that has already grown so big in markets like the U.S. that it lacks much upside. Yet the company has emphasized the importance of international growth, leading the way with initiatives to look beyond the U.S. and other developed markets. Key markets like India and China still have relatively low adoption rates of digital payment systems that provide Mastercard with huge growth opportunities to serve billions more people across the globe. Corporate partners are also turning to Mastercard for co-branding deals, and those relationships have become increasingly important in the cutthroat card business. Going forward, Mastercard has plenty of room to capture new business and increase its market share against its longtime rival as well as up-and-coming players in the electronic payments space.